Tucked away between Derwent Water and Buttermere is a delectable group of hills defined by clear ridges and enviable viewpoints. These are the North-Western Fells, and they give some of the most enjoyable walking in the whole National Park. The pity is that I have been here so little. A childhood holiday led to a failed attempt on Cat Bells, the ‘beginner’s hill’ that is almost a rite of passage for Keswick holiday-makers – the top seemed always too far away. I had more luck in 1974, climbing the Grasmoor group with friends from work (Mike, Ray, Geoff, and another Peter I think). That was it until 2017, when I planned a few days based in Keswick with my younger son Adrian, then aged 25. On the list were the Coledale horseshoe and the ridge around Dale Head, but alas only the former was practical, though I did manage a quick bag of Whiteless Pike as well. Wednesday 2 August 2017. 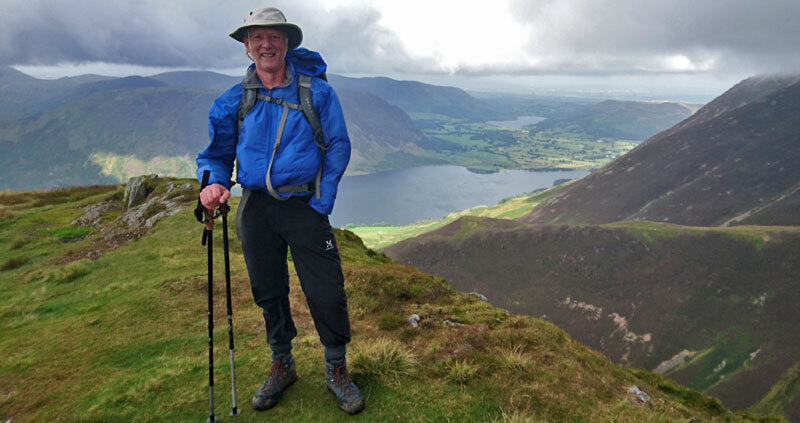 The Coledale horseshoe, 10 miles. This is one of the Lake District’s premier horseshoe routes, covering all the fells – seven Hewitts in all – that enclose the Coledale Beck. It was alas a grey and scruffy day, with some rain around, and strong winds with dodgy visibility on the tops, but conditions weren’t so bad as to call a halt. We took the bus to Braithwaite, walked a little way along the road, and went through the gate that climbs the subsidiary hill of Kinn. From here we took the Sleet How ridge to the summit of Grisedale Pike (2595ft), where the ridge to Hopegill Head (2526ft) could intermittently be seen curving away to the right, with the intervening top of Hobcarton Crag (2452ft) in the way – it was only when down from the hills later that day that I realised it too was a Hewitt. These three hills form the ‘out’ of the horseshoe; there’s an unavoidable dip to Coledale Hause, just below 2000ft, before the ‘back’ leg can start. This begins with a prosaic climb to Crag Hill, at 2753ft nearly up with Grasmoor as the main hill of the group. However what follows is one of the Lake District’s top ridge walks – I can only imagine the brilliant day out that could be had with any sort of decent visibility. There’s first a steep drop and climb onto Sail (2536ft) before easier ground onto Scar Crags (2205ft). The final hill, Causey Pike (2090ft), may be the lowest of the group, but its distinctive ‘triple notch’ overlooking Derwent Water makes it perhaps the most interesting of them all. Alas by now Adrian’s knee was not doing all the things it should, and the descent was to prove a pain in more ways than one. We had a fair little road walk to get to the Hawse End landing stage for the boat back to Keswick, but as if by magic the Rambler bus – I didn’t know it came down these little lanes – made one of its two-hourly sweeps past at just the right time. Friday 4 August 2017. Whiteless Pike from Buttermere, three miles. While Adrian took a boat out onto the lake, I had time for a quick bag of Whiteless Pike. It wasn’t on my descent route from Wandope and Crag Hill back in ’74, and otherwise it doesn’t fit into a round, so it might have been a sore thumb on my Hewitts map without an opportunity like this. It was a breezy day but rather better than the Coledale day had been. I parked up at Buttermere and gambled on a two-hour ticket. Though I made good progress up the clear path, I clearly wasn’t the fastest person on the hill today! Ascending, there were good views all around, but the view over Rannerdale to Crumnock Water and Loweswater was especially fine. There’s a rock band (ie, a band of rock, not the Stones) to make things more interesting before the summit, where a Slovakian couple (from Nottingham), who had overtaken me, encouraged me to pose for a pic. They wanted to know what the next hills were, so I told them – Wandope and Crag Hill. Learning that the latter was the 800 metres-plus, off they went. Meanwhile, I scurried back down, nearly slipping on the band – teach me for having a timed car park ticket. But I made it, with five minutes to spare. Just the one, unless you count the above-mentioned failure on Catbells sometime around 1967. Saturday 3 August 1974. Whiteside (2359ft), Hopegill Head (2526ft), Crag Hill (2753ft), Wandope (2533ft) and Grasmoor (2795ft), from Buttermere.